Lord knows, it’s been a long time coming, but I am, at long last, slowly breathing life back into the WorldFoto blog. 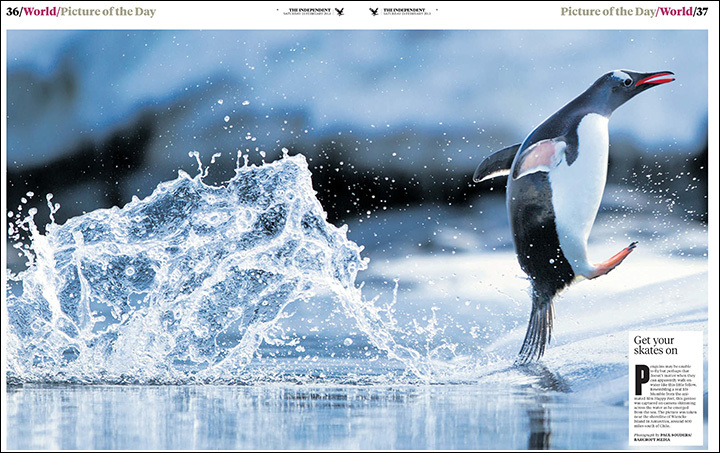 Today’s post shares a recent clip from UK’s The Independent newspaper, which featured my image of a Gentoo Penguin caught in flight near Port Lockroy, along the Antarctic Peninsula. The image is part of an upcoming gallery of images of (nominally flightless) penguins in flight. This entry was posted on Wednesday, February 27th, 2013 at 3:05 pm. It is filed under News and tagged with Action, Antarctica, Penguins, Published Work, Wildlife. You can follow any responses to this entry through the RSS 2.0 feed.